And my personal experience in collaboration of students in my classes... It was difficult for me to answer the "yes or no" questionnaire. Because all my answers were: "it depends..." or "sometimes"
Are your students required to work in pairs or groups in most lessons? Not always. It depends on the lesson. 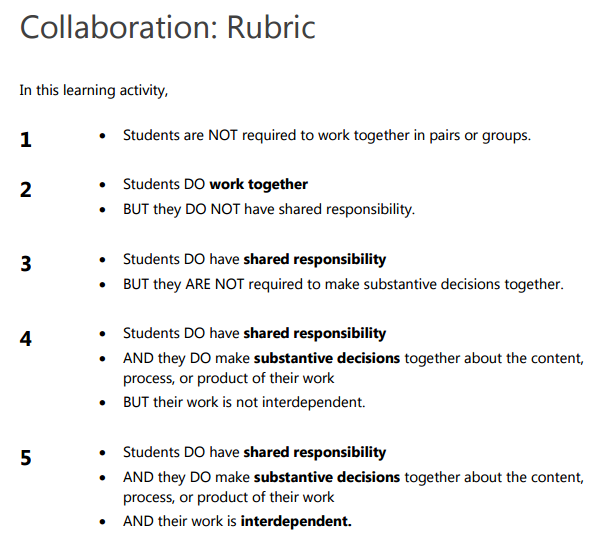 Do your students have shared responsibility for tasks? Not always. I know that they should. The more I learn about pbl the better I organize the teams. Do your students have to make substantive decisions when working together (decisions that will impact the result of their joint work)? Usually yes. That's the core element of collaboration, isn't it? Is the students' work interdependent of each other (in other words can they only succeed together)? It should be. But happens when one students doesn't work? The rest want that their team succeeds, so they take over his work. Is it right? Should I leave the team fail because of one student?